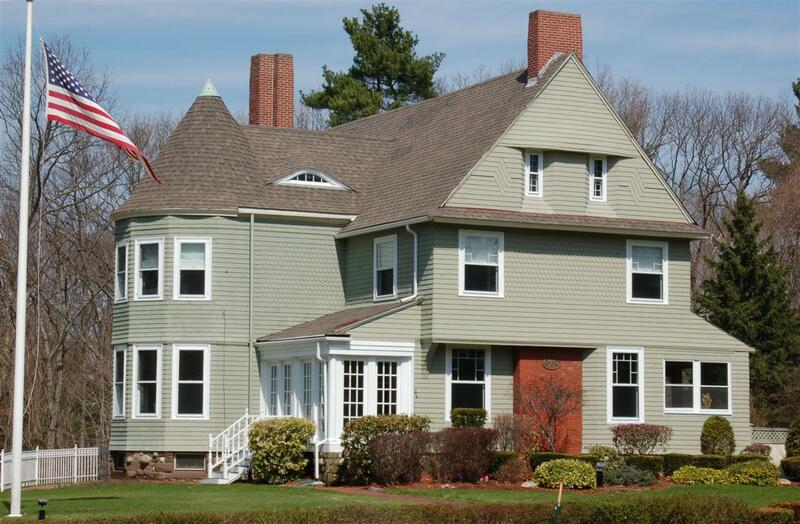 Shingle-style, eyebrow windows; pattern shingles, small-paned glass; roof surfaces sweep down to cover turrets and frame windows. For many years the house was a natural dark brown stain before painted green and then in 2007 gray. John Abbott, W. Phillips Foster & Daniel P. Abbott sold four parcels of land to Mary Ann Perry on May 31, 1856. Two parcels were across the street on Phillips St. Parcel four was on the "northside of Central and ran south by the road then east 200' by land conveyed by Nathaniel Swift & John Abbott to property of B. Farnham Carlton then north 70' by land now or formerly on N. Swift & John Abbott. Then west 200' to Central St. by the lot where in is erected the Catholic Church, being the same." The St. Mary's Catholic Church Society of Lawrence had created the St. Augustine's Parish in 1866 although they were established in 1852. The land for the church was purchased from Mathew Cully by Archbishop of Boston John Bernard Fitzpatrick on June 22, 1852. The church also owned a right of way from Central down to what is now Lupine Road to the rail road tracks. This may have been a direct route to the Catholic Parish Cemetery. The Catholic Parish worshiped at this location for 28 years and 1880 was in the process of building a new Gothic style wooden church at 43 Essex St which they completed in 1880-81. The Parish then sold their property on Central St.
Mary Ann Perry sold the four parcels to Lyman A. Belknap on June 13, 1879. At that time Belknap and his family were living across the street in 68 Phillips St. (Poor-Torr House). Lyman A. Belknap was a Boston businessman. On the site at 71 Central was the first St. Augustine's Catholic Church in Andover. It was a wooden cruciform building as shown on the 1883 Birds Eye View of Andover, Mass. map. on the edge of the sloping hill with two other structures on the site, a residence cottage for the priest and a small barn. The church sold this site to Benjamin Franklin Smith on March 29, 1881 for $1010. April 1, 1881 Andover Advertiser pg. 2 B. Frank Smith has purchased the “old Catholic Church edifice” and land connected with, situated on Central Street. The building has not been used since the Society have occupied their new church on Essex Street." Smith then sold the property to Belknap for $1 and more on April 1, 1881. Lyman moved the structures off the property to build his new Shingle style 10 room home. He sold the cottage and barn to the Electric Co. and they were moved to Lupine Rd. The Andover Townsman (AT) - April 26, 1889 AT pg. 1 - Hardy and Cole have contracted to build Lyman A. Belknap’s new residence on the site of the old Catholic Church. The cottage which was on the lot and the old barn have been sold to the Electric Light Company for removal to their premises. The Church having been sawed in two, Mr. Belknap has moved the front part to his lot this side of E. H. Barnard’s; the back part, unless sold, will be moved back and made into a stable. It is said that the current garage-barn in the rear of the house is a portion of the former church building. A note in the historical files states "base of altar in carriage house in 1950" After the house was completed Lyman transferred the property to his wife Carrie L. Belknap in July 1890. May 24, 1889 AT - On the site of the old Catholic Church, Mr. Belknap’s new house is being framed (by Hardy & Cole) Soon to go over the fine cellar which Napoleon IV has nearly finished. May 16, 1890 - AT pg. 4 - B. B. Tuttle has purchased of L. A. Beklnap a part of the Old Catholic Church building and it has been moved by Wilson to land next to the blacksmith shop of Anderson and Bowman on Bartlet St. He will use it for a stable. July 12, 1889 AT - The house of L. A. Belknap, Esq. on Central St. promises to be one of the handsomest residences in town. August 2, 1889 AT – L. A. Belknap’s house is being wired for electric light by the Holtzer – Cabot Company of Boston. January 17, 1890 AT - L. A. Belknap and family are enjoying their new residence on Central Street. Belknap lived here until 1899, indicating he may have used house only as summer place or rented it out. Carrie Belknap sold the property to Mary Noyes (Tyler) Jones on June 7, 1906 and she held the property until Dec 9, 1953 when her estate was sold by Warren P. Tyler and Everett W. Smith, Executors to Mitchell & Dorothy V. Johnson Jr. who held the property from Dec. 1953- Dec.1974. Johnson sold to Roland Baker Jr. trustee of Abel Realty Trust on Dec. 17, 1974. Baker had the property for 21 years changing the name to R.B. Realty Trust then selling to George P. & Meredith L. Borstell in August 1995-Mar. 2008. Jerome S. Romano and wife Karen E. Simeone purchased in Mar. 28, 2008- Oct. 2013 before selling to Kurt & Deborah D. Eldracher. Belknap is said to have also built the house at 84 Central for his gardener. Later known as Frederick Jones House - through 1950's. F. Tyler Carlton – 1904 - 1968 b. 1904 d. August 14, 1968 age 64. F. Tyler Carlton, grew up at 67 Central Street, was a native of Andover, married Alice Loomer and had one daughter Mary Barbara, wife of Carl W. Tapp, of Portsmouth, NH. Graduate of Northeastern Engineering School, Boston, and was an engineer until his retirement. He was a member South Church, past president of the Andover Historical Society, a member of the Scouters Organization of Lawrence and the Engineers Club of Boston. No. 71 which I knew as Aunt May Jones. Three large elms and a smaller maple lined the street as one approached the drive at the brow of the hill. Although there were many other elms in town, it seemed that every year there were Baltimore orioles swinging and nesting in these. Two very large maples stood near the north lot line and an elm just south of the front walk. Just a few feet southwest of this elm is the iron cover of a well. Number 71 is the old location of the Catholic Church before the one on Essex Street was built in 1895. Uncle Fred said jokingly that he had his own supply of holy water as he supposed that the well has been properly blessed. The house was built by Belknap in the late 1890's. It is wrongly oriented in that the rooms are all on the northeast side and the halls on the southwest. It had dark-finished woodwork and was consequently dark even though richly furnished. A formal reception space was at the left of the front door, with a fireplace set at an angle with the hall. To the left of it was an upright piano, and in the curve to the south (this is the base of the tower) was the Victrola. A sofa and a bookcase were on the street side. The hall had a settle against the big stair landing around which one had to go to reach, by two steps, a landing and two more steps. The grandfather clock stood in the corner between the doors to the dining room and living room. Although there were five windows here, this room was always dark because of the covered porches at each end and the dark mahogany furniture. Bookcases, shoulder-high, lined the wall between the archways leading to hall and dining room respectively; bookcases flanked the southwest window and there was another in the west corner. Two armchairs, originally Morris chairs, either side of a central table and lamp, faced the fireplace; at the south end were two armchairs and Lucy Tyler's old round mahogany table. On the front, opposite the dining room entrance was a window seat extending around to the north side where "occasional" chairs and later a radio found a place. To the left of the fireplace was the well-filled wood basket. apple tree kept only because the bluebirds nested in it each year. One year they failed to nest. That year the tree fell down. The dining room was finished in oak, a square table and high-backed chairs, a sideboard against the front wall, and a plate rail all around. The inner front corner had a small table with tea service, hidden behind a screen with Chinese motif to match the rug. The inner back corner had a built-in sideboard next a swing door leading to the butler's pantry and through a door there to the kitchen and cook's pantry. Off the latter was a walk-in refrigerator once supplied with ice from the outside, later electrically cooled from the cellar. A flight of stairs led up from the rear hall on the south side of the house; here was the maid’s sitting room and the back door opening on the small porch. Up the front stairs another corner landing before you turn right and go around the stairwell to a sewing (or spare) room in the tower. The master bedroom was over the living room, across the front; the guest room - later Aunt May's - over the dining room, with a private bath. Behind that was another bath, off the hall, and a bedroom - Miss Sue's. Hannah (the second girl) had a bedroom at the very back. The guest room bath had been modernized 1930 style, but the back one must have been as originally designed in 1895. The tub was tin-plated copper (built-in.) with a sheathing frame. The marble washbowl had the usual flat marble top with carpenter-built drawers below. The woodwork was of stained mahogany and matched the stand of Uncle Fred's shaving mirror. All was very nice but I can't but think it might have been better reversed! The drive double curves in from the southwest corner of the lot just as the street tops the hill. It is screened from the woods by grapevines and, curving still further beyond the stop at the brick-paved walk to the front porch, leads to the big barn door. The barn is in the northeast back corner of the lot and was, I understand, formerly part of the Catholic church. The big barn door lets onto the main floor where I found Alex Waldie hitching up the horse. He told me one day that he was giving up his job, that Uncle Fred was going to sell the horse and have the shafts taken off the carriages. He could not drive the carriage without a horse so he was going to leave. Soon he was at No. 65, caring for Aunt Ella's horses, and as time went on he, like all of us, learned to drive without a horse. Lincoln Cates took over the gardening and care of the yard, and with him I often went to the wood lot out South Main Street between Orchard Street and Wildwood Road. Having stabled the horse in the shed there, we gathered corn, squash, cucumbers, beets or whatever Serena the cook wanted of what was available. In the winter there was wood to be loaded on the pung and brought in to be stored behind the driveway wall. another wide door, on the right a box stall with two straight stalls against the far wall. Back of the big door a watering trough pierced the wall to be usable from either room, and in the small harness-room back of that the harnesses hung behind a sliding glass door. There were two flights of stairs - one up and one down - on the street side of the main floor. At the front there was a finished room with fireplace for coachman and gardener. Upstairs were two more finished rooms, one over the wash corner, the other with fireplace over the front room. The rest of the second floor was hayloft with the exception of the space over the carriage storage and that over the harness room - the latter a small, closet-like room. The upstairs was narrow board siding. right hand steering with progressive shift, and handbrake outside over the running board. The horn was blown by a hand-squeezed rubber bulb. Carbide gas lighted the huge brass headlights and the brass sidelights beside the flat windshield. Where today it is chrome, it was then brass that had to be hand polished. The running boards or steps extended between the front and rear fenders or mudguards. A few years and the cars changed to left-hand drive, from progressive to selective shift, to shift lever and brake on the front floor. Air horns gave way to electric “klaxons” and headlights increased their power with electric bulbs. Uncle Fred at first insisted on having the top down to get all the, fresh air; it had to rain - not just sprinkle – before the top was raised. Later the top was up all the time but no isinglass curtains. Finally came the closed car and Robert Clements the chauffeur, was allowed to have his window open the merest crack. For years Aunt May's car was a Winton and when the company offered a prize for the greatest number of miles with the fewest number of accidents over a given period –Uncle Fred arranged to take long trips (what were long in those days) in order to run up his mileage. Thus Robert had the prize “in the bag!” Aunt May's registration number from 1910 was 4593 which she kept until her death. It now belongs to her niece, Ruth Tyler Smith. Lyman A. Belknap – Jan. 4, 1887 – b. 89 p. 172 - Central St.
Mary Noyes (Tyler) Jones estate - Dec 9, 1953 - Warren P. Tyler and Everett W. Smith Extrs. Mary Baker - Aug. 8, 1984 - b. 1852 p. 338 mtg.